Roughly one year ago, EU Member States decided to renew initiative behind the EU Defence Cooperation. The Permanent Structured Cooperation on Defence – PESCO – agreed on the 11th of December 2017, just launched another 17 new projects on the 19th of November 2018, adding to the first set of 17 projects, which were agreed upon on the 6th of March 2018, in an effort to strengthen the European defence dynamic. This list demonstrates the EU Member States’ willingness to increase efficient exchanges and cooperation regarding Defence issues for over a year. Divided into seven different categories, these projects cover multiple fields of actions, such as: “Training, Facilities”; “Land, Formations, Systems”; “Maritime”; “Air, Systems”; “Cyber, C4ISR”; “Enabling, Joint” or “Space”. Today, 25 EU Member States have agreed upon a more binding commitment for European defence through this new structure, in order to tackle issues inside of a European “Comprehensive Defence Package”. These efforts have been put into place at the same times as the new European Defence Fund (EDF), proposed by the European Commission. The EDF aims to provide: “financial incentives for Member States to foster defence cooperation from research to the development phase of capabilities including prototypes through co-financing from the EU budget. PESCO projects may benefit from increased EU co-financing, which could amount to 30% – instead of 20% – for prototypes” (2018, Factsheet: Permanent Structured Cooperation ). The Integrated Unmanned Ground System (UGS): (led by Estonia, Belgium, Czechia, Spain, France, Latvia, Hungary, Netherlands, Poland, Finland): “The objective is to develop a Modular Unmanned Ground System with the following capabilities: Multi-mission capable platform to carry different payloads (transport, ISR, tethered UAV etc.) and sensors, Cyber secure autonomous navigation capability for route and mission planning with different options for manned-unmanned teaming. EW resilient Command & Control interface capable of swarming and interoperable with existing C4 systems”. The EU Beyond Line Of Sight (BLOS) Land Battlefield Missile System (led by France, Belgium, Cyprus): “The project aims at developing an EU new generation medium range BLOS Land Battlefield missile systems family. The output is intended to be integrated on an extensive variety of platforms (ground-to-ground and air-to-ground) and to provide integrated and autonomous target designation capability. The project includes joint training and formation aspects. Dedicated “users’ club” is envisioned develop a common European doctrine on BLOS firing”. (2018, Updated list of PESCO projects). Important to note, is that just after the domains of “Cyber, C4ISR” and “Enabling, Joint” or “Space”, the “Land, Formation, Systems” domain received a total of 6 projects, the second highest number of projects overall. Those projects are taking place in a general mobilisation of European actors concerning defence issues. A large majority of Member States have signed up to PESCO projects. “Only the UK, Denmark and Malta are not taking part in any projects” (Rankin, J., 2018). This means that these countries “will have no decision making rights over PESCO governance or any veto over the future strategic direction of PESCO, which has been openly acknowledged as greater EU integration in the field of defence” (UK Parliament, 2018). Nevertheless, the EU authorities and defence actors stressed the opportunity for “third parties” to be involved in mutual beneficial cooperation. Even if the proper terms of a third party participation have not yet been determined, “the UK has already expressed an interest in a Dutch-led project on military mobility, which complements efforts currently underway on this issue within NATO” (UK Parliament, 2018). Simultaneously, these new projects also demonstrate a reinforcement of the dialogue between European Industries and European Defence Authorities, as attested by the discussions during in the second edition of the European Defence Industry Summit, on the 6th of December 2018. At this summit, experts and representatives presented the rules and purposes behind the relationship between European Institutions and Policy and the Private Sector and Industries, with the constant backdrop of PESCO and its future implementation and development. Written by Emma Marty, on behalf of the Finabel Permanent Secretariat. PESCO Website (Accessed on the 30 of November https://pesco.europa.eu/). (2018), “Defence cooperation: Council launches 17 new PESCO projects”, European Council. 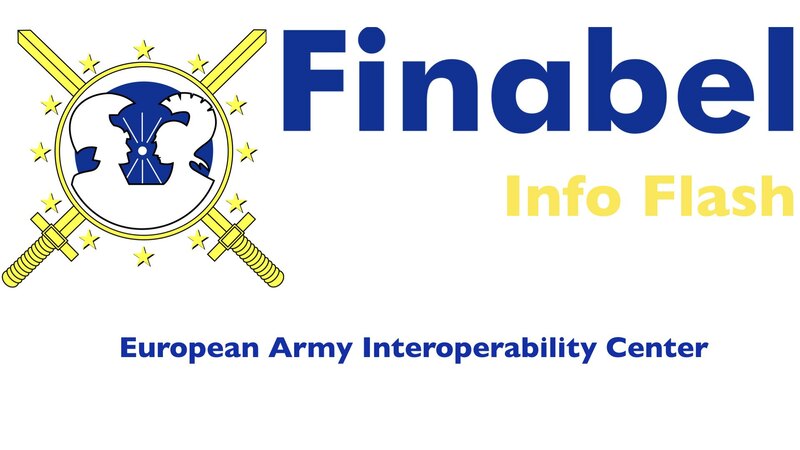 (Accessed on the 30 of November https://www.consilium.europa.eu/en/press/press-releases/2018/11/19/defence-cooperation-council-launches-17-new-pesco-projects/# ). (2018), “Part 3: Permanent Structured Cooperation on Defence PESCO”, European Union External Actions. (Accessed on the 30 of November https://eeas.europa.eu/headquarters/headquarters-homepage/49449/part-3-permanent-structured-cooperation-defence-pesco_en). 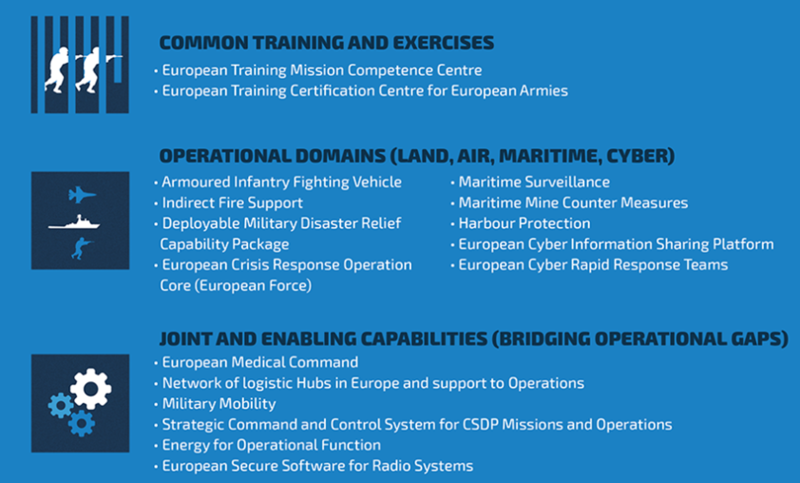 (November 2018) Factsheet: Permanent Structured Cooperation – PESCO Deepening Defence Cooperation among EU Member States”. (Accessed on the 30th of November https://cdn5-eeas.fpfis.tech.ec.europa.eu/cdn/farfuture/wM5QZfoVgVbC4zSzD-u–4o8E9TqYoThT3aNfAC6TQA/mtime:1542983709/sites/eeas/files/pesco_factsheet_november_2018_en_0.pdf).